Brooke Salas looks for Gia Pack through a warming CSUB defense. New Mexico State (16-6, 8-1 WAC) strengthened their cushion at the top of the WAC standings Thursday night after a 61-48 win over a scrappy Cal State Bakersfield team (9-13, 5-4 WAC). CSUB came into this evening’s matchup ranked in the top-20 nationally in four different defensive categories including steals per game (12.2, good for seventh) and total steals (257, good for eighth), the ‘Runners impressive defensive numbers were no match for head coach Brooke Atkinson’s team, as NM State took care of the ball for the most part and only allowed CSUB to convert seven steals. A “timid” first quarter by NM State allowed the ‘Runners to jump out to a 10-8 lead, and right out the gates, it looked like Bakersfield was going to back up their defensive numbers and make a statement. 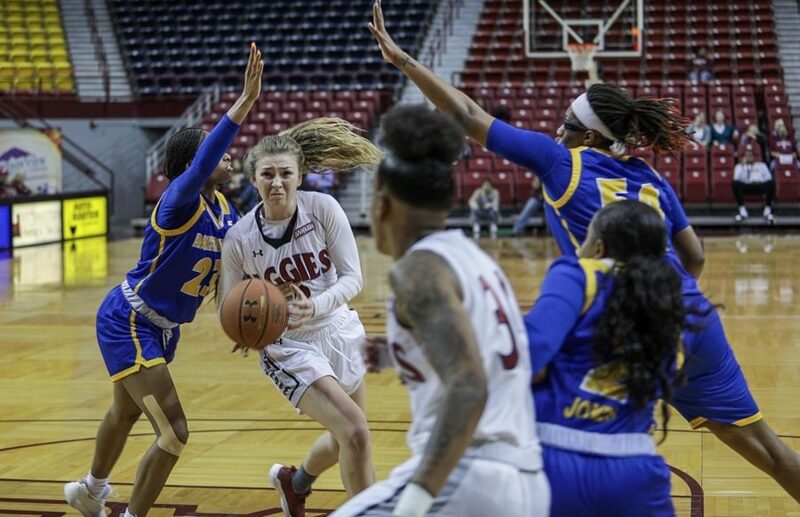 Atkinson and her team were able to adjust and create offense from their defense, where in the third quarter, the Aggies began to run away with the game (NM State held CSUB to just 9 points in the period). The Aggies improved from just 21 percent from the field in the first quarter to shooting well over 40 percent in the second half – finishing the game at 38 percent. Senior guard Brooke Salas achieved her 14th double-double of the season, with 21 points and 12 rebounds, inching her way up the NM State all-time scoring list. Salas is on pace to finish her Aggie career at second place on the list (Anita Maxwell is likely safe at the top women’s scorer spot with 2,601 points). As tournament time is quickly approaching, Atkinson will look towards her upperclassmen’s leadership to carry this team to a possible regular season title and tournament championship. Revenge will be on NM State’s mind as they host Grand Canyon (5-14, 3-6 WAC) on Saturday Feb. 9 at 2 p.m. – whom the Aggies lost to in Phoenix 54-51 at the start of WAC play.